By now, you have heard the heartbreaking news. 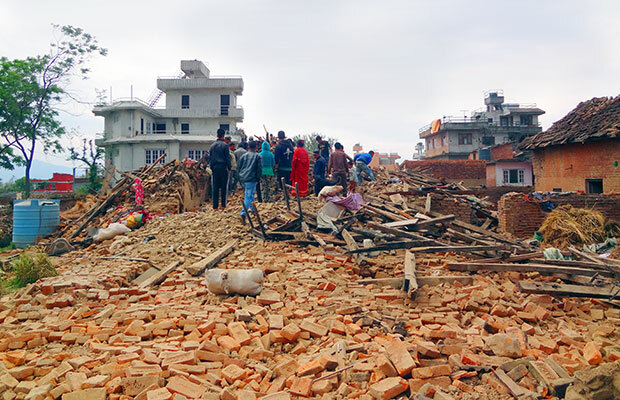 A 7.8-magnitude earthquake rocked the area of Kathmandu, Nepal in the early hours of April 25th — flattening homes, toppling electrical wires, crumbling water pipes and triggering devastating avalanches. Terrified people are left to cope in the cold and darkness… searching for loved ones. More than 4,000 are confirmed dead, and over 7,000 are injured, some gravely. Many remain missing. Thousands of terrified children have lost one or both of their parents. And sadly, with rescue efforts in the early stages, the death toll is expected to rise. Survivors — traumatized by their experience — are huddled in the streets, with no protection from the cold and rain. Those few whose homes remain standing are frightened to enter them; persistent aftershocks threaten to strike additional buildings to the ground, taking more innocent lives with them. They have lost almost everything. And they desperately need your help. Almost immediately, Salesian missionaries were on the scene providing what assistance they could. Since 1995, these missionaries have served among the poverty-stricken population. They built schools and offered opportunities to thousands of youth and families in and around Kathmandu, the suburb of Lubho, and two additional areas of the country. This means we are known, trusted and uniquely positioned to respond to this crisis in ways that other organizations cannot. Our immediate concern is to provide basic humanitarian aid to as many people as possible.Tents and tarps for shelter and protection from the elements; warm clothing; sanitary supplies; medicines and especially, food and clean water will all be critical for their survival. Your caring support today means that we can adequately address the challenges before us. In a nation of 27 million desperately impoverished people — with close to half of its regions affected by this disaster — the earthquake has dealt a devastating blow to the hopes and futures of its residents. Your caring kindness lends us the strength we will need to prevail in the face of such adversity — and to restore a sense of optimism and possibility as we seek to help families rebuild their lives. Every gift to the Nepal Emergency Fund, no matter the size, makes a real difference. Our deepest gratitude for your prayers and support.